Creekside Springs: What Do We Offer? Creekside provides bottled water of all sizes ranging from 12 oz. to a 2 1/2 gallon size to wholesalers, supermarket chains, convenience stores and distributors. Our equipment flexibility allows for distinct corporate branding and packaging. Via co-packing arrangements, Creekside bottles and packages single serve enhanced water on behalf of certain customers using customized label and packaging. These customers may provide all necessary packaging materials, labels and additives to Creekside, and Creekside converts these materials to finished product and may coordinate warehousing and/or transportation. Enhanced waters may include flavors, vitamins, electrolytes, preservatives or other additives using a customized batch process. 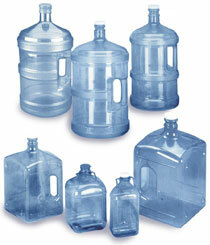 Bulk Returnable Sales – Creekside bottles returnable 3 and 5 gallon units for customers in truckload quantity for delivery by the various distributors or franchisees.